As the Schacht Community Manager, I try to keep aware of what is going on within the various groups on Ravelry. This month I saw a discussion devoted to fractal spinning and immediately thought it would be a marvelous technique to share with our Schacht community. The set-up is simple and the end result can be variable but highly rewarding. Although the name of this technique is a slight misnomer since we aren’t splitting the fiber infinitely, the effects are infinitely striking. 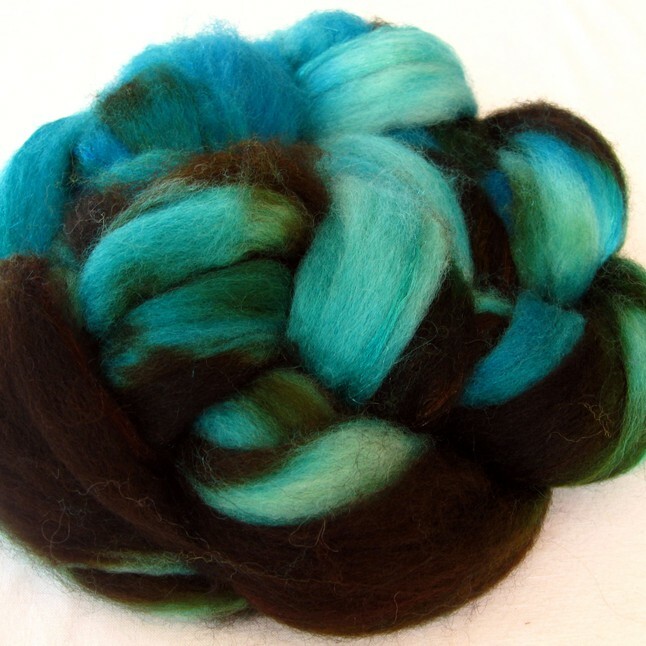 I got together with Sarah from Yarn Geek Fibers and ordered 4 ounces of the Organic Polwarth in the Verdigris colorway. I thought the high amount of contrast would be perfect for this technique. I spun the singles and plied them on my Schacht Sidekick. I was able to get 240 yards of worsted weight yarn from the 4 ounces of fiber. The basic premise of fractal spinning is to choose a braid of fiber that has very distinct color changes throughout, and then split the braid into two even sections, then split one of the sections further into sections. For mine I first split the braid lengthwise into two equal portions. I pre-drafted the first half to make spinning easier, then spun from one end down to the other. The second half, I split into four even sections lengthwise and then spun them end to end. This creates two singles that have the same color repeat order, but one single has one long repeat, where the other single has four shorter color repeats. The bobbin on the left is spun from the first section, creating one long color repeat. The bobbin on the right is spun from the four sections end to end, creating four shorter color repeats. I plied the two bobbins together with the color repeats going in the same direction, which gave me a very interesting skein of yarn, although the overall pattern is more apparent in the cake of yarn. The long color repeat interacts with the shorter color repeats to create an almost ombre effect as the color changes move through the yarn. This effect can be seen in the above picture where the brown is concentrated in the middle of the ball and the turquoise is concentrated on the outside. This ombre effect is much more apparent in the finished piece below. Since the variation throughout the skein was so great, I decided a crochet or knit piece would best show off this yarn. With crochet seeing a resurgence in popularity, I decided on a crocheted kerchief. The effects of the color pooling in the finished kerchief show just one way yarn made with this technique looks when made into a finished item. If I had plied the singles with the repeats going in opposition to each other, the effect would be different. I could have split the second half fewer times or more times to get even more different effects or I could have started by splitting the fiber into thirds to do a 3 ply yarn. The possibilities are endless and the stunning results are seemingly complicated, yet completely simple. Take a look at the Ravelry thread for more pictures and tips on fractal spinning, and be sure to post on our Facebook and Pinterest to connect!